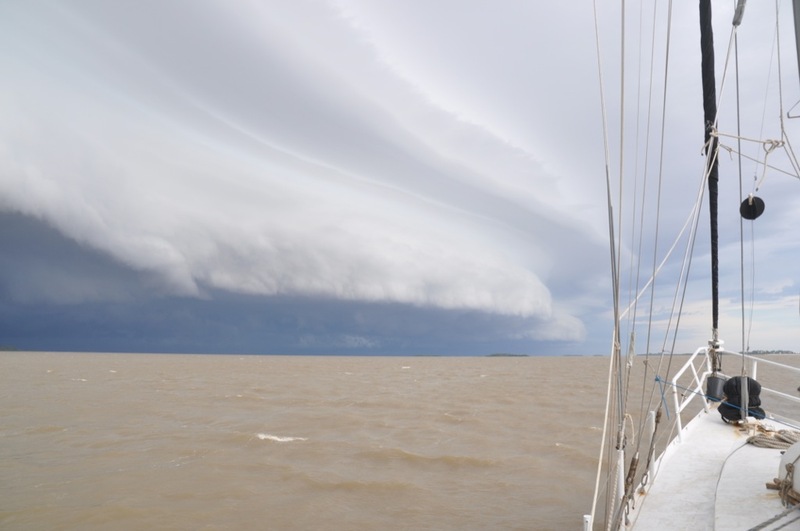 For the past six months we’ve been hanging out on the Rio de la Plata, or River Plate, exploring the estuary and – more importantly – getting the boat ready to go south. 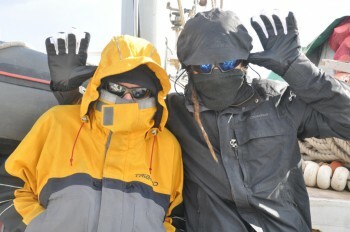 There’s a lot of work involved in preparing to face the Southern Ocean. 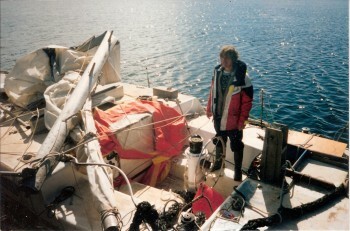 18 years ago when we went south with our previous boat we were capsized in storm force winds and the vessel began to fall apart. 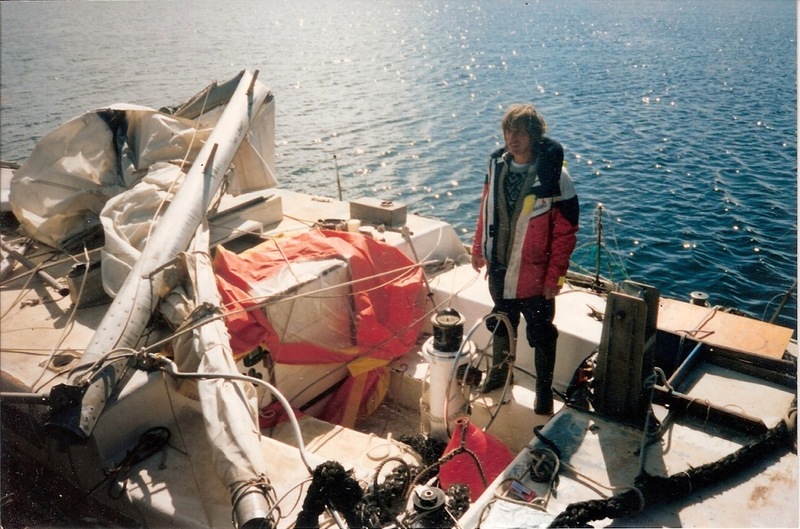 The hatches were torn off, so that the waves breaking over the deck had access to the cabin; the masts broke and the engine was swamped, so that we were stranded. (You can read all about it in A Family Outing in the Atlantic.) 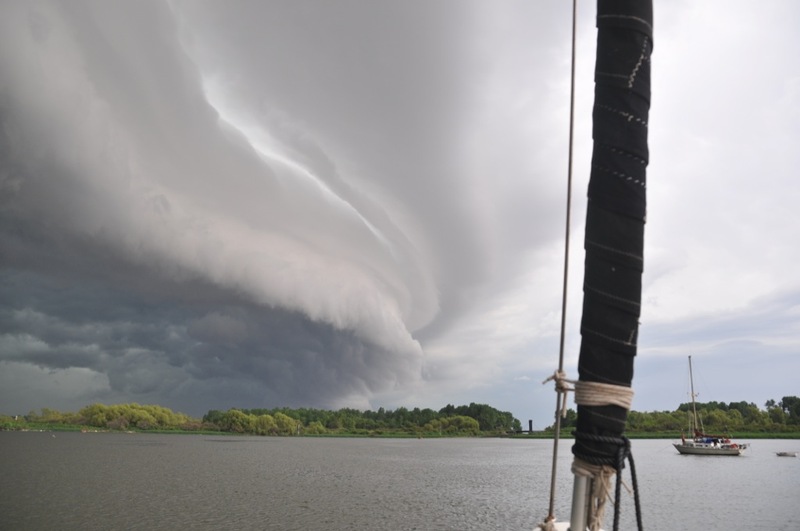 When we built Mollymawk it was with the ambition of creating a stronger, safer boat; but ambitions cost lots of time and effort, and they cost money. Thus it is that we’ve been a long time getting our act together again. We had trouble activating our emergency beacon. … I was deathly cold, sitting in the cockpit. My clothes were soaked and I shivered uncontrollably. It was getting dark and I knew I would not make it through the night. The boat was taking on water [probably through the sink outlet and the loo, although Pete didn’t realise it at the time], the batteries were flooded and no pumps were working. We were sinking. After two hours there was no sign of rescue, nor had we any idea whether or not our signal was received by anyone. Paul found a 2-way radio and I transmitted our mayday message. No answer. The boat was awash now and I told Paul to get ready. Two more waves and she went down. We stepped up into the ocean with no sign of a helicopter in sight but I held the strobe light beacon in one hand and tried to keep my head clear of the breaking waves. I drank a lot of sea water. Then, a lovely sight. Searchlights on the water from the low-flying helicopter coming towards us. 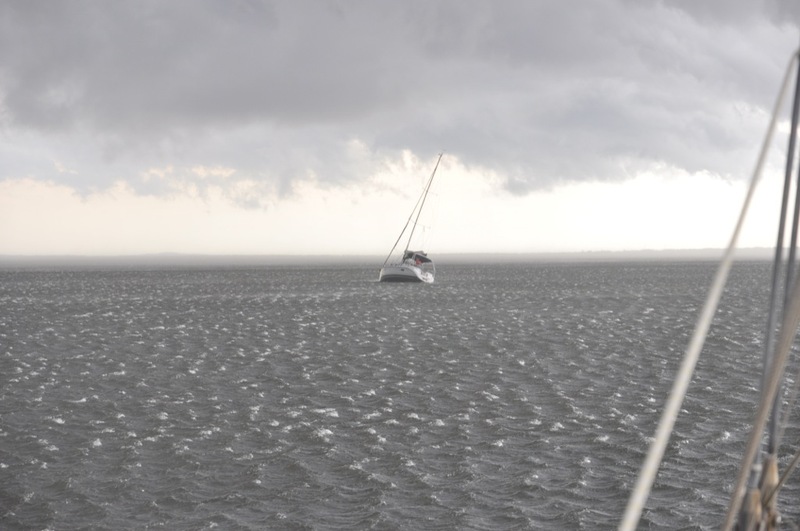 The pilots hovered clear of the huge waves and dropped one swimmer on a cable and then another. These brave boys hauled us to safety. Everything was at the limit. The helicopter’s range, our ability to stay afloat, our strength, our hopes. They did it and we survived. The full story is told by Pete in his blog. He has now given up sailing, he tells me, and is paragliding instead; as if that were safer! To be so very near to our goal and yet still not quite ready to set off is very, very frustrating, but we don’t want to find ourselves in this sort of trouble again; hence, we are determined that everything must be ship-shape – and hence the seeming procrastination. One of the first things that we did when we arrived on the Rio de la Plata was fit a wood burning stove. (Just in case you’re wondering how it would get on in a capsize – it’s bolted to the steel floors.) 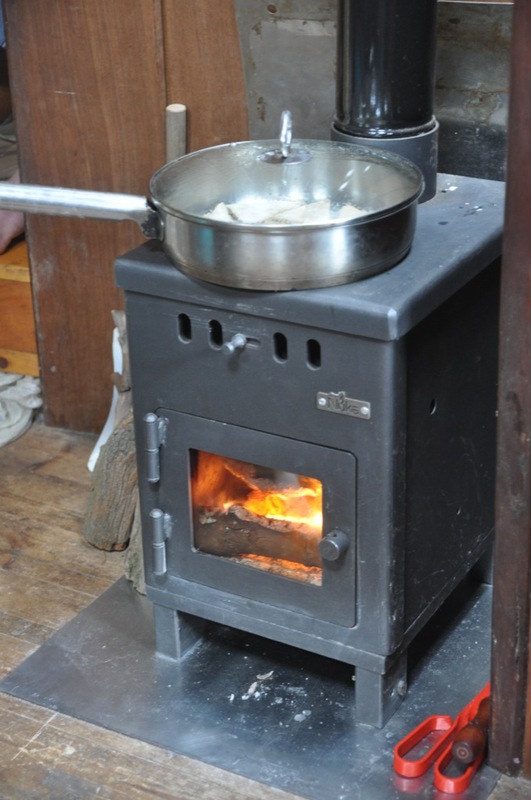 Having now had experience of both diesel and wood stoves we’re in a position to discuss the merits and disadvantages of each – and we plan to do so, in a future article. Living aboard in a wintry clime we also discovered the inadequacy of our insulation. Where the hull is covered in thick slabs of cork everything is fine, but there were too many areas which we had missed – areas such as the deck beams and the frames – and so Caesar devoted a lot of time to sorting out this problem. Since we were unable to find slabs of cork we had to search for some other kind of material, but finding one which was both effective as an insulator and environmentally harmless was not at all easy. In the course of our researches we gathered up various insulation materials and tested their flammability – and we’ll be reporting on that, too, at a later date. 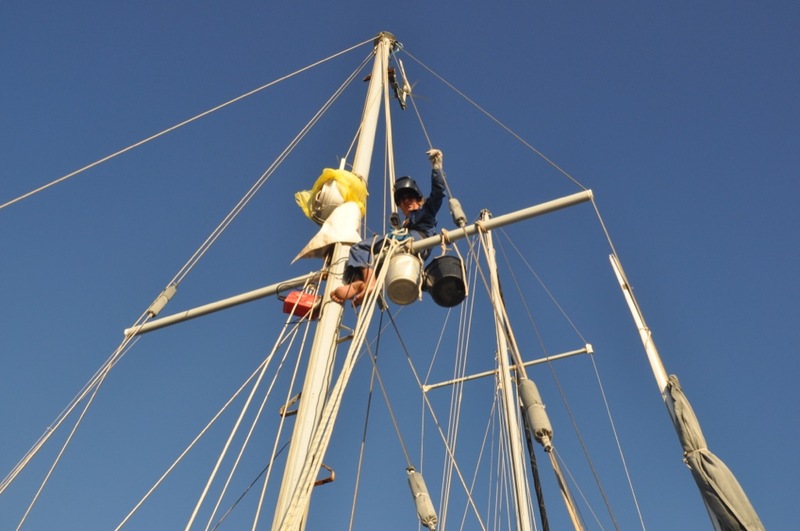 Besides this, we also tackled various pieces of maintenance, such as the re-bedding of leaky windows, and Nick did a fair amount of welding aloft, beefing up the strut which holds the mizzen forestay (or jumper, as it is properly called). Apart from the heater there have been two other additions to our ship’s inventory over the past few months. 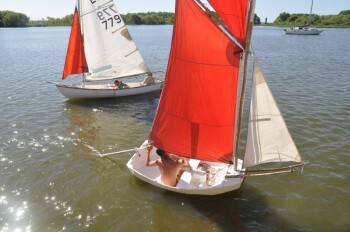 One was a new sail, which we talked about in a previous article. 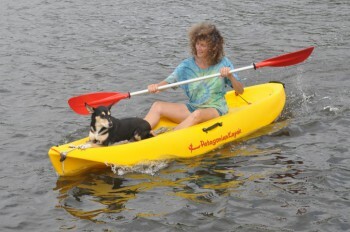 The other was a kayak. Five years ago we acquired two inflatable kayaks, and whilst these have provided us and our friends with a wealth of entertainment it has been apparent for a long time now that they are not really sufficiently rugged to cope with the rough and tumble of cruising life. Throughout the past three years I’ve had my eyes open for an affordable, compact, super-rugged sit-on-top kayak – and I’ve finally found it. 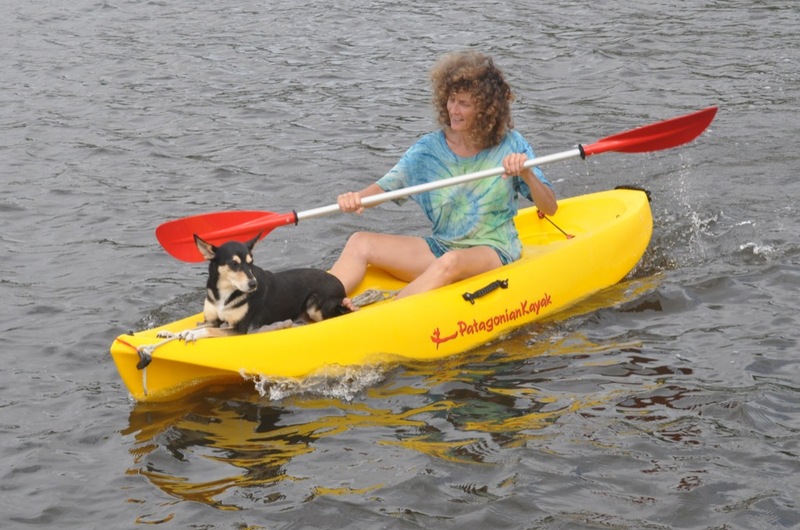 Made in Argentina by a company called Patagonian Kayak, it is reasonably light, steers well, and fits snugly on our side deck. Some time in the course of the next few weeks we will give it a proper review and consider the pros and cons of polythene v. PVC. Yes, yes… I know… It’s a ruddy great lump of plastic and we don’t need any more plastic in the world! But in this case it’s a lump of plastic which, all being well, we should be able to protect from degradation, so that it doesn’t have any affect on the environment. Besides being fun, we reckon that this robust kayak will also come in handy in the land from which it takes its name, both as a means of slipping swiftly and silently closer to nature and also as a quick-launch vessel for running mooring lines ashore. Ever wanted to build a boat? Then this is the book for you. But it is much more than that – it is the beautifully written story of a family and their quest for the perfect yacht on the proverbial shoestring. It starts with their capsize and dismasting in the Southern Ocean and decision to build the perfect boat, goes on to their finding a half-built project in South Africa – which some might see as a disadvantage but they turn into an advantage – rebuilding it on a farm (with a growing number of children both in its shade and in the boat itself), launching, fitting-out, and eventually sailing off into the sunset.. Multiple obstacles are thrown at them – discovering their bargain steel boat needs complete re-welding whilst not (yet) knowing how to weld, for example. 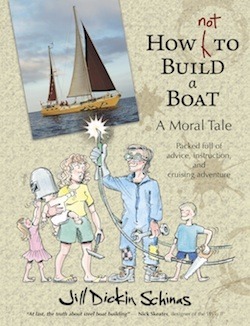 Their 18 month project eventually takes some ten years and is a salutary lesson in how ‘not’ to build a boat, but it is written with humour and illustrated throughout with amusing and well-executed cartoons. My own favourite in the way the book is put together is the ‘dirty fingerprint’ marking each technical page, and it should be said that How NOT to Build a Boat is a mine of useful information, with clear and comprehensive technical diagrams and measurements of useful information, with clear and comprehensive technical diagrams and measurements in the style of our own Ian Nicolson. Jill and her husband Nick have some interesting and thought-provoking ideas about everything from the ideal cockpit to how to design and make your own portholes, from the best rig to how to construct your own self-steering gear. How NOT to Build a Boat is an absolute necessity for anyone who wants to build their own boat, particularly in steel, but would also be very useful to anyone with a penchant for improving their current boat. All in all it is very practical but immensely readable – enjoy! I also have a couple of new books in the pipeline. 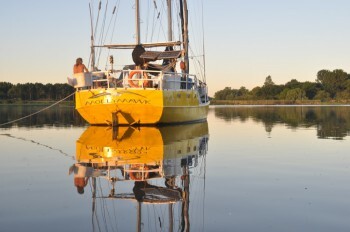 Roxanne, meanwhile, has been working on the boat and writing a new book! The book is not quite ready to face an audience, but the lockers which she built under the sink are the delight of this galley slave. It’s ten years and more that I’ve been asking for them! Needless to say, we’ve also spent plenty of time over the past few months enjoying ourselves – because, after all that’s what this lifestyle is all about! Shortly after arriving in this part of the world we received a visit from our good friend, Gean, who sat on a bus for 44 hours in order to join us. Since he had never before set foot outside Brazil, the River Plate’s climate came as something of a shock to Gean, but he bore it well. 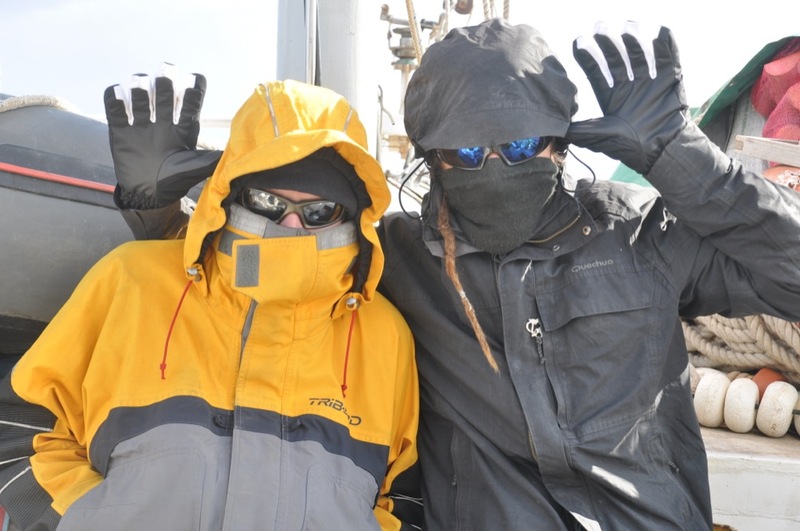 In fact, the novelty of wearing gloves and other woollens evidently appealed to him in some way, and he eventually left us to sail further south on another friend’s boat. Another highlight of this interlude on the Plate was our encounter with Pete and Carly Hill aboard their amazing junk-rigged catamaran. Pete and Carly are the only people we know who have now travelled up both of the rivers which wind their way across Argentina and empty the effluent of the nation into this estuary. We’ve been almost running into Pete for many years now – he was boat building in South Africa at the same time as us – so it was good to finally meet up and compare notes. We also had the chance to go for a spin aboard Oryx. 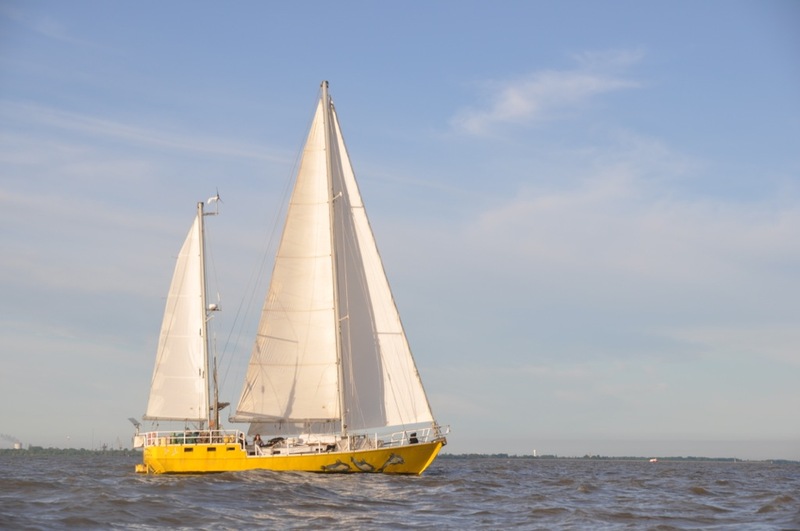 So named for her the twin masts, which stick up like the horns of a gemsbok (or oryx), this boat is about as unconventional as a cruising yacht could ever be, and yet she is also a cosy comfortable home. We will be writing more about her and her owners in a future article. Besides finally running into Pete, during these past few months we’ve also managed to tie up two other loose ends, as it were, and get together with two other families of cruising yotties with whom we’ve been “virtual” friends for some years. 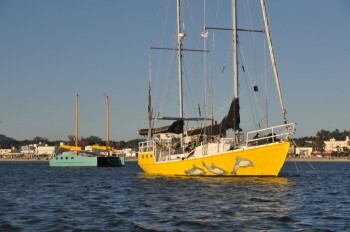 The first of these was the Sundblad family, whose home is a steel boat called Ypake. Ypake is currently in Europe, but as luck would have it the family happened to be visiting their family in their home town of Buenos Aires. Also passing through were three-quarters of the crew of Suvarov, another steel yacht belonging to Austrian-born David and his Argentinian wife, Gui. 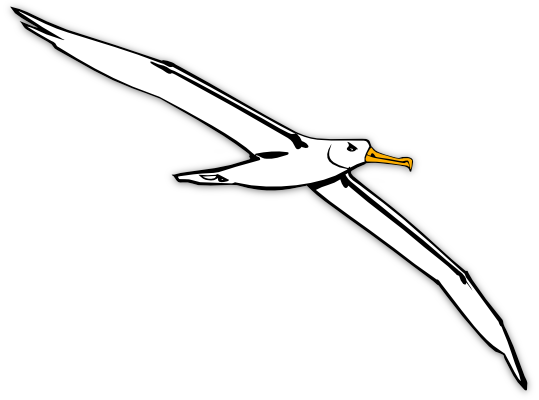 Yotties are normally known by the name of their boat – and thus we are the Mollymawks – but this lot refer to themselves as Los Locos. This is perhaps just as well since they parked their first boat on a reef in Polynesia. Losing a boat is just one of those things; it happens from time to time – (Nick and his folks lost their first cruising yacht on a reef in Papua New Guinea; Nick Skeates lost his first cruising yacht in Fiji; Bernard Moitessier lost three, one in each ocean…) – but it would have been tiresome having to change your name as well as your boat! 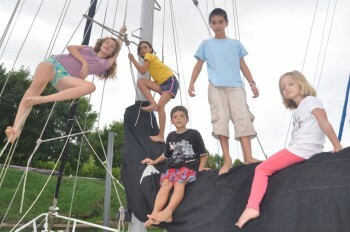 The junior Locos had fun climbing in the rigging with Roxanne and our friends from Saoirse Mor, and Gui and I spent the afternoon comparing notes on home-schooling and on how to do the laundry in half a gallon of water. 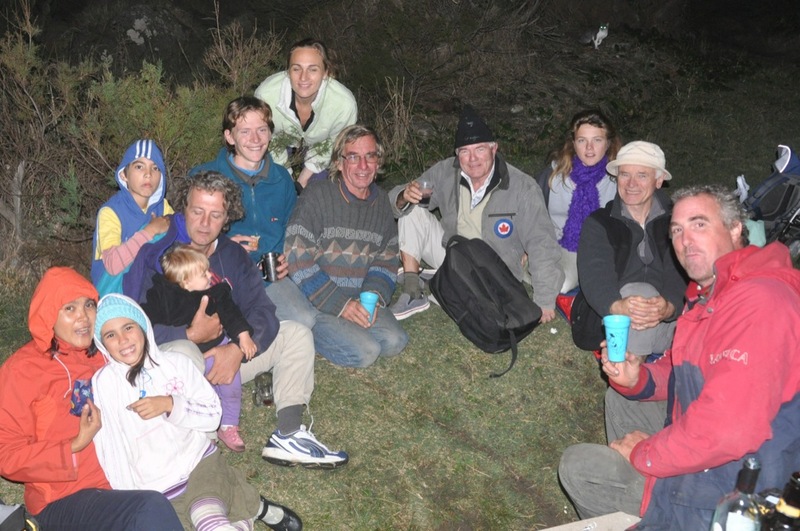 As well as running into friends that we hadn’t set eyes on before we’ve also made a lot of new friends on the Rio de la Plata. In fact, it’s become increasingly obvious that the world is simply chock full of friends who we just haven’t yet got round to meeting! It’s also small enough to be bustling with friends who we have met. If you’ve lived all your life in one country, that probably sounds odd. 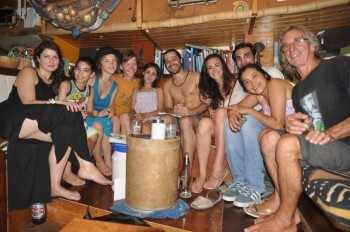 How likely is it that you would meet someone in, say, the Canary Islands, and then run into them again in Argentina? But travellers tend to make friends with other travellers, and since travellers are travelling…In any event, likely or not it’s been happening a lot lately. First we ran into our Scottish friend, Tom, who happened to have run into our French friend, Axel… with the result that they dumped one boat and are now hanging out together. Then we ran into our Austrian friends, Franz and Anna and baby Milena. 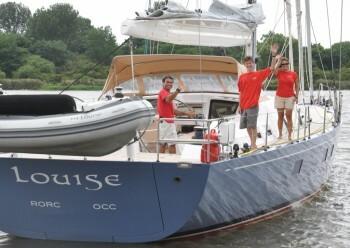 In fact, Daniel and Beate now have two tenders – one each! So we had lots of fun racing each other around the anchorage. If you’re thinking of buying or building a sailing dinghy you might like to read this article, penned some years ago, and you might also like to check back in a few weeks’ time and read about Frodo and Sam and about our fantasy Dream Cruising Dinghy. Daniel and Beate also decided that the time had come for them to invest in a new liferaft, and so, rather than just ditch the old one, they invited us to join them in launching, boarding, and generally enjoying this piece of safety equipment. The story of our Liferaft Party is both entertaining and educational. 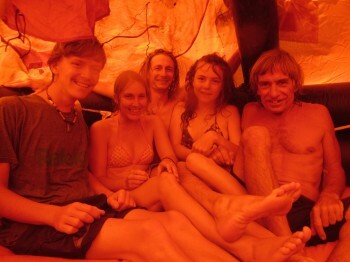 As for Morgan and Cheryl – we first met Morgan on the island of St Helena some ten years ago. Like Caesar and Xoë and Roxanne, this young Frenchman and his sisters and brother grew up cruising, and like them he has never lived in a house; but by the time we encountered Morgan he was already in his mid-twenties and had just abandoned the family home and bought a boat of his own. Cheryl is a saint (from St Helena) and she met Captain Morgan at about the same time that we did. 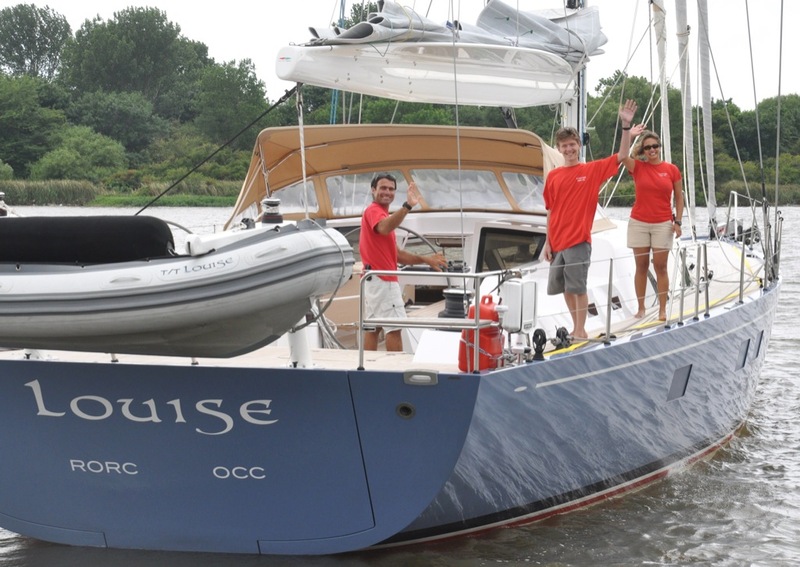 They’ve been sailing together ever since, in a variety of different vessels, and they are currently managing a flash new 72 foot racing machine by the name of Louise. The chap who owns Louise is a sailor. This may seem obvious, but in fact many of the people who own big fancy boats are not that keen on the sailing side of the game. 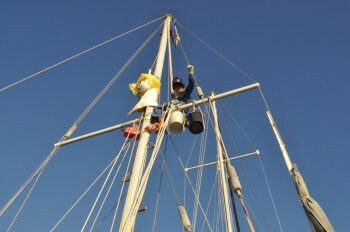 They like to have their boat moved about the globe so that they can join her, at their convenience, in exotic locations. But the chap who owns Louise is different, as I say. He wants to actually sail his boat around the world himself; and not the easy way, either – not via Panama. He wants to travel via the Capes. Follow this link to see his photographic account of A Quick Trip to the Falklands. 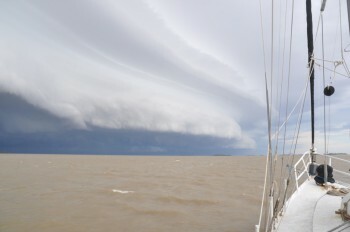 That just about wraps up the story of our interlude on the Rio de la Plata. In closing we’d like to share a few more photos which provide a glimpse of our life on the riverbank. The weather in this part of the world could best be described as variable. Depending on whether the wind is in the north of the south, the place gets blasted with either a hot wind or an icy one. In December we enjoyed a fortnight with temperatures in the 40s… but the locals didn’t enjoy it; apparently it was the hottest month ever, in Argentina. This was followed by the wettest ever January. The hot weather seemed to go to some people’s heads. Here are two videos showing different ways of crossing the creek. 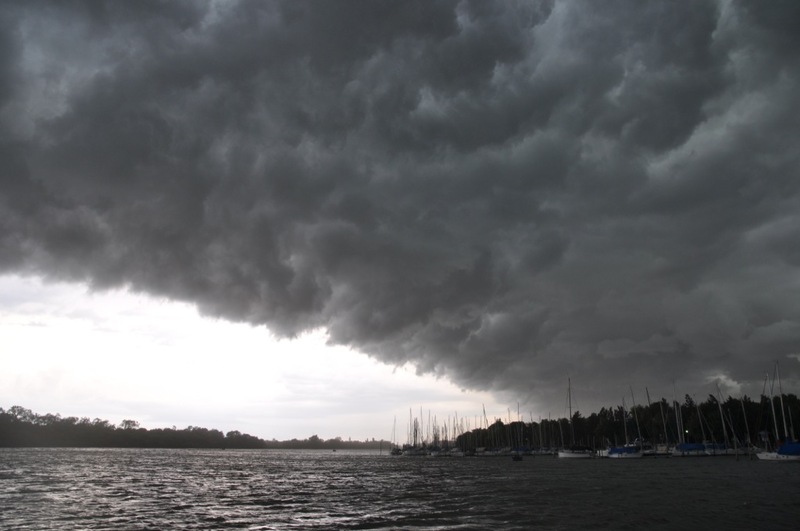 When it isn’t blowing from the north or the south, the weather here is often thundery, and the thunderstorms arrive on the back of fabulous cold front squalls known as pamperos. These pamperos frequently hit with an initial gust of 50 knots or more; and as they are a fortnightly or even a weekly occurrence we have plenty of photos of them rolling in. We’ll bring this epistle to a close with some of the more dramatic shots. It was a wind such as this which sank four of Cabral’s caravels as they set off from the newly discovered land of Brazil towards southern Africa. At least we know that Mollymawk can cope with this kind of stuff! 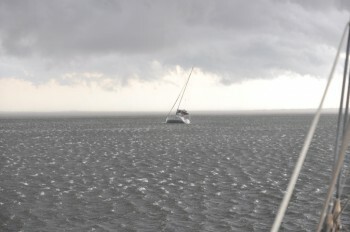 The strength of the first gust can be seen by the way this yacht is heeling, under bare poles. We’re always delighted to hear from our readers. If you want to drop us a line, scroll down to the comments box, below. blog like this require a large amount of work?